Randolph College set record highs for giving during Giving Tuesday on November 27. During the daylong event yesterday, 725 alumnae and alumni, parents, friends, faculty, staff, and students contributed to the Annual Fund, helping Randolph raise over $285,000. The results broke records for the College in both participation numbers and dollars, making Giving Tuesday 2018 Randolph’s largest-ever day of giving. This is the fourth-straight year Randolph has participated in the worldwide day of giving, and the College far exceeded its goal of 500 donors. It also surpassed last year’s record of 596 gifts totaling $150,000. Giving Tuesday is a globally recognized day of giving back and follows the holiday shopping days of Black Friday and Cyber Monday. On this day, individuals worldwide unite their efforts for the benefit of the charitable causes that matter most to them and for the betterment of their communities. All Annual Fund gifts given to Randolph on November 27 counted towards the Giving Tuesday gift tally. The Annual Fund provides crucial unrestricted revenue that touches many facets of the Randolph experience, including scholarships and internships, faculty professional development, and campus beautification, just to name a few areas. 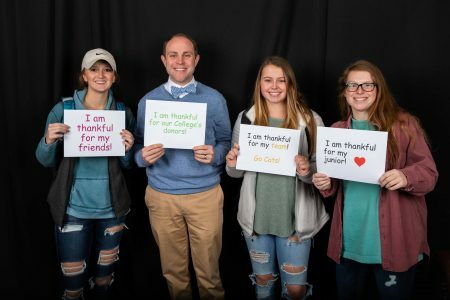 On campus, the Office of Institutional Advancement hosted several events to get students involved and to show their appreciation, including signing thank you cards and posing in an “unselfie” photo booth during lunch at Cheatham Dining Hall. Students also did their part to give back on Tuesday night, partnering with Park View Community Mission and Food for Thought to pack meals for local children in need. Off campus, many alumnae and alumni, parents, and others provided matching gifts and special challenges to encourage giving. In addition, nearly 200 ambassadors and advocates shared the campaign with classmates and friends via social media.